This year we are giving our Sunday School model an update. Kindergarteners through 5th-graders will experience a rotation of workshops about a single Bible story over the course of four weeks. On week one, all kids will gather for Children’s Chapel, where they will be introduced to the story for the month’s rotation. This fall’s first rotation is the stories of creation from Genesis (see below). On weeks two through four of the month, kids will rotate through a series of activity workshops led by members of the congregation who will help them to more deeply experience the bible story. Each rotation will also be connected to a justice topic to help kids and adults think of ways the bible story connects with the world and how they might make the world a better place. Volunteers welcome! Our new rotation model will provide the opportunity for people who wouldn’t otherwise interact with our kids to help out with a workshop rotation. Do you enjoy crafts? Singing? Leading Games? Cooking? Science? Your passions are needed in Sunday school this year! Volunteer as an individual or as a team to lead the same activity workshop or be a shepherd for three weeks in a row! Please contact Rev. Douglas or Cynthia King if you would be willing to help or if you have questions. Faith Fairs are back this year with a quarterly focus on a specific world religion during the Sunday School hour. 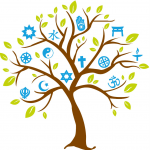 Rather than a Religion 101 course, this program seeks to introduce kids to various aspects of the religions of the world through age-appropriate activities, crafts, and stories. On Oct. 22 our first Faith Fair of the year will focus on Judaism. Pizza, messy art, and balloon dance parties will be back when Parents’ Night Out begins again on October 13 from 6-9PM. Parents Night Out is a great time for kids to have fun and build community with other kids and adult volunteers here at church! Sign up for this program by visiting https://goo.gl/forms/yKfbptKwdNpyxAtD2. All Seasons Choir is a voice choir for children ages 4–12 years (ages are very flexible). Rehearsals are on Sunday mornings from 9 to 9:25 am in the Choir Room, and parents are welcome to stay with us or enjoy the morning church activities. The children perform regularly for the morning worship services as well as for the early Christmas Eve service with the children’s pageant. After our rehearsals, the children either go to Charming Chimes or to Kids Club. Directed by Tracy Halter. Charming Chimes is our youngest bell group and has been around since 2003. It is directed by Matt Balin, and rehearsals are at 9:30 am on Sunday mornings in the Youth Music Room right after All Seasons Choir (at 9 am). It’s geared for elementary age children, and the ability to read is a plus but not required. The goals of this group are to learn basic music skills, to be a part of a musical group, to perform when ready for our morning worship and, most of all, to have fun together. It is a preparatory group for those kids who may be interested in playing in Beloved Bells.